In the early 1980s, the Supreme Court decided some 150 cases a year, nearly twice the number it annually decides these days. 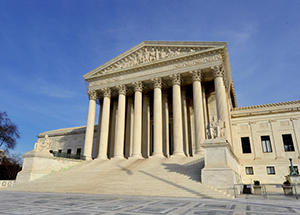 Legal scholars and practitioners of law have criticized, lamented and even denounced this “docket shrinkage,” but while much attention has been paid to how the Supreme Court decides its cases, far less attention has been paid to the question of which cases the Court chooses to decide — and which cases it chooses not to. That question is taken up by University of Notre Dame Law School professors Randy Kozel and Jeffrey Pojanowski in a paper titled “Discretionary Dockets,” forthcoming in the journal Constitutional Commentary. “Legally speaking,” Kozel says, “the Court has almost complete control over the cases it decides to hear. It chooses whether to review more cases or fewer cases. It chooses whether to resolve hot-button disputes or dense statutory puzzles. It chooses when to intervene and when to let the political process run. “We argue that the justices’ approach to selecting cases should have direct consequences for how they write their opinions. The Court could review lots of cases and decide them narrowly, giving us numerous data points through which we can understand the law. Or the Court could review relatively few cases but decide each one quite broadly to make sure society is getting the guidance it needs. Originally published by Michael O. Garvey at news.nd.edu on October 29, 2015.